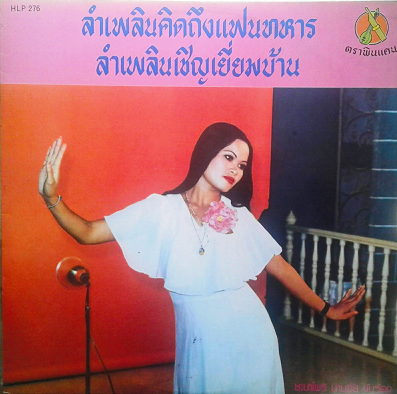 Chabaprai Naamwai is from Kalasin Province and issued some excellent records on the "Thra Pin Kaen" Label in the 70ties. This one, HLP 276, is one of her best, collecting some of her best "Lam Phloen" Songs. Basically I choose to upload this set because so far I feel that I did not yet post a lot of Lam Phloen (just the Pet Phin Tong Albums) even though my main motivation for this blog was my wish to make Lam Phloen better known. Chabaprai sings a more accessible kind of pop style Lam Phloen, which is good as an introduction to Lam Phloen. The early songs in the 50ties and 60ties had only the singer and the Kaen, and gradually musicians added drums and electric instruments. Usually these songs start with the singer vocalizing (ooh la nor... ooh la nai....) and after a minute or so the drums and other instruments kick in. Great fun, great music! Get on your dancing feet here! If you like this, take a look at the excellent Monrakplengthai Blog, where you find an early tape, and another excellent post at saoban esan with a lot of information on Chabaprai!